Some physical therapy works better than others. After teaching physical therapy at Chiropractic college, and researching what really works well consistently, we have arrived at a combination of therapies that really do the job. Here at CHASE Chiropractic we offer spinal decompression therapy with our DRX 9000 machine. There is now a wealth of research available that essentially proves this works quite well. There are still some doctors who say it does not, but I have found that those doctors have no experience with the DRX, and have not read the research! If you have a compressed disc, herniated disc, sciatic pain, numbness or tingling, even stenosis, the specialized program offered by Dr. Leahy may be just the thing for you. It is a successful alternative to back surgery. In fact many patients see us after their surgery to actually fix the problem. As good as the DRX 9000 is, it is not for everyone. We will need to look at your MRI, go over your history, and examine you to find if this is the right treatment. There are certain findings that tell us that decompression therapy won’t work. In that case, a different approach would be in order, and if we can’t do it here, we will refer you to the right doctor. After all, the goal here is the best treatment for you. We also offer MedX rehabilitation exercises for both the neck and the back. MedX rehabilitation exercises specifically target the muscles surrounding the discs in the back and neck, allowing for more stability. 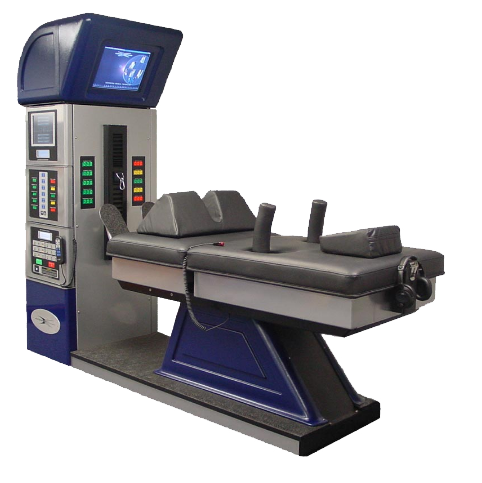 Medx is the state of the art for testing and exercising the spine. This allows us to stabilize and strengthen the spine, thus protecting the discs, and do so without causing pain. For some people, it is the only back exercise they can do without pain. It is a very important part of the spinal rehabilitation program here and it is one of the reasons we have so many successful outcomes. Check out the page on A Perfect Light. It is a major breakthrough in healing tissue, and pain relief. It works so well that we have two of them running all day. Here are some of the many research abstracts that demonstrate the effectiveness of the DRX program: coming soon, ask us to email you the studies if you like.